The confusion between the caduceus and the Rod of Asclepius is suddenly all the rage. In Dan Brown's Inferno , Robert Langdon clarifies the distinction between the two symbols to World Health Organization director Elizabeth Sinskey. 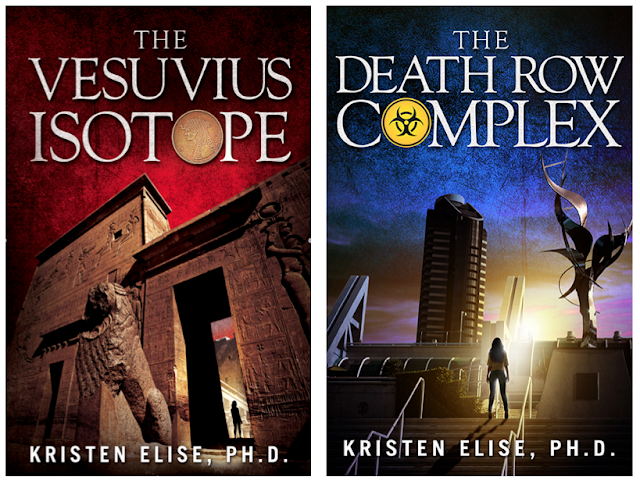 In The Vesuvius Isotope , we follow the caduceus from Paris to ancient Egypt. But here, we begin in ancient Greece. Asclepius was the Greek god of medicine, and he held a rod that bore one snake. This snake winds around a Rod of Asclepius asymmetrically, and there are no wings. 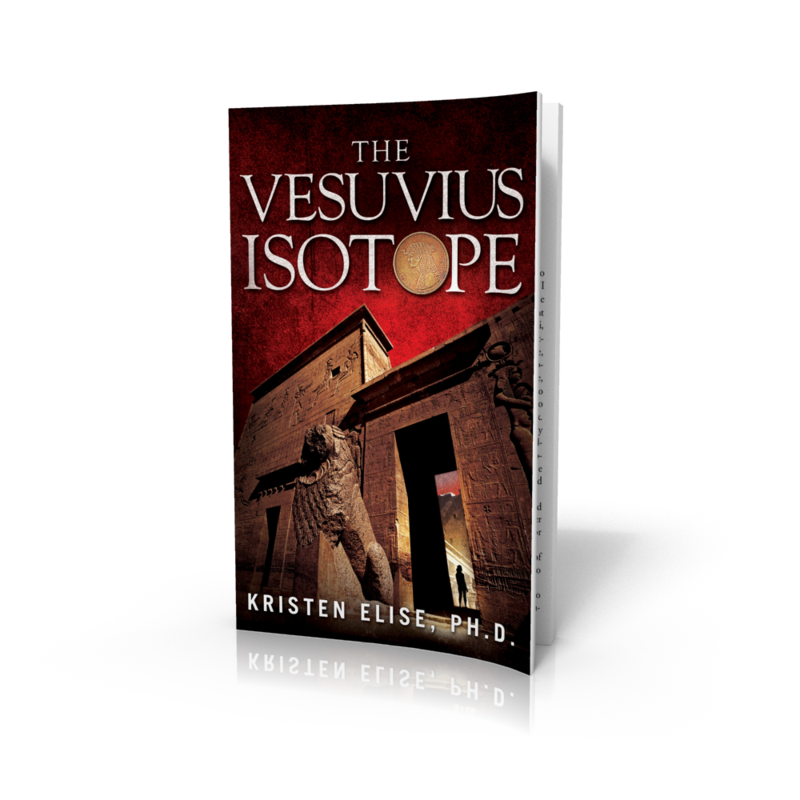 There are two hypotheses as to where the rod of Asclepius came from and how it became associated with medicine. One is the 'worm theory,' which dates to the Ebers papyrus (~1500 B.C.E,) one of the first ancient Egyptian medical documents. The Ebers papyrus describes a treatment for worms. The emerging end of the worm is to be wrapped around the end of a staff and the staff wound until the worm is removed, like a big fish is reeled in on a fishing rod. This technique is still used today. The other hypothesis dates to the Bible. In Biblical Lore, Moses carried a bronze staff, around which a bronze serpent was wound. Anyone bit by a serpent need only look at the staff to be healed of the snake's venom. This particular medical technique, I’m fairly certain, is not in practice today. In contrast, the caduceus is a symmetrical staff with wings and two snakes. 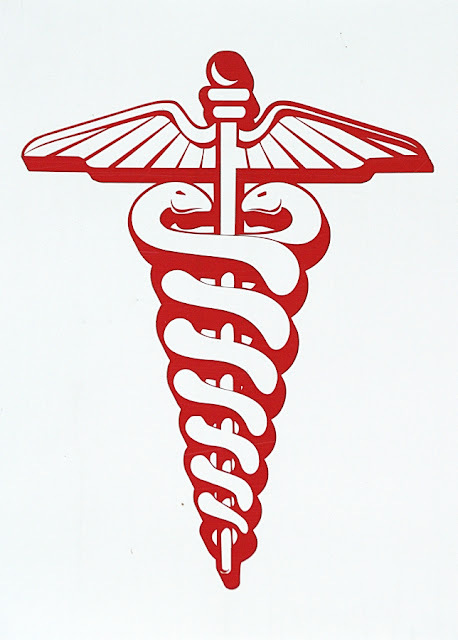 The common dogma claims that confusion between the two symbols is what led to the association of the caduceus with medicine. The common dogma also claims that the caduceus symbol first appeared as a medical symbol in the 15th century, when a Swiss medical printer used it as his printer’s vignette. I happen to believe that all of this is a crock. This story maintains that, like the Rod of Asclepius, the caduceus hails from ancient Greece. It is thought to have originated with Iris, the messenger of Hera. Yet, this association of the caduceus with Iris and then with medicine is actually quite ironic—because Iris, while frequently referred to as messenger, was actually more like Hera’s hit woman. In Greek mythology, Iris carried a vessel filled with water from the River Styx. And at Hera’s request, she used this ancient elixir—an ancient pharmaceutical, if you will—to put liars to sleep. In later myths, the caduceus also became associated with Hermes, which brought the connotations of treachery and deception along with Hera's connotation with death. So we see that our so-called ‘Greek’ medical symbol was in fact more like a skull and crossbones in ancient Greek mythology. To find the caduceus in medicine, on the other hand, we must travel instead to ancient Egypt, where Isis—the ancient Egyptian Goddess of medicine—brings wings and snakes to a vertical staff. But first, we go to Paris. We enter the Louvre and descend into the Egyptian rooms, and we are immediately drawn to the sarcophagus of Pharaoh Ramses III. 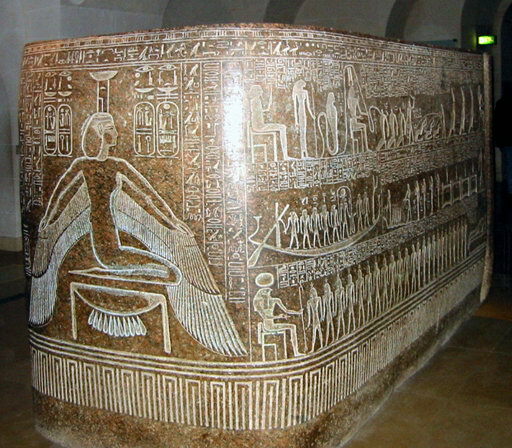 On this sarcophagus, dating to approximately 1150 B.C.E., is a large, winged Goddess Isis. The Egyptians liked to incorporate Isis in their burial chambers because they believed in resurrection, and Isis brought life. To an imaginative eye (or to one who works in the medical field and sees a caduceus in everything,) the Isis depicted on this tomb may resemble a caduceus. Not convinced? That's OK. Me neither. We now travel to Aswan, Egypt, to the largest Temple of Isis of the ancient world. It is on the island of Philae, and the temple is the single, massive feature adorning the entire tiny island. We progress into increasingly smaller and darker rooms until we are led by birds and more birds into the inner sanctuary. Look at the birds—do they remind you of anything? Me too. As we progress deeper and deeper into its depths, we realize why this place is called a sanctuary. The temperature drops abruptly, and we at last feel a life-giving breeze, relief from the merciless Egyptian sun. She always wears a sheath dress (as in this photo.) And she never, ever has wings. 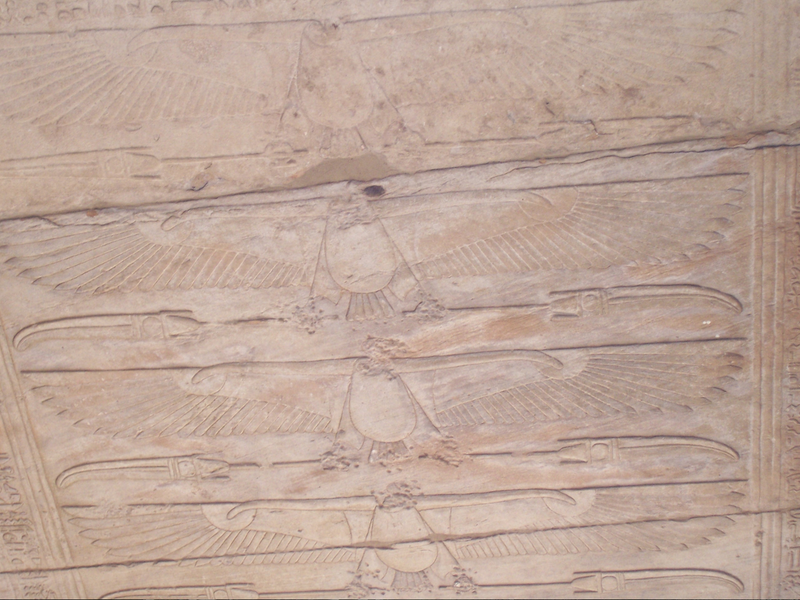 Why would the Goddess Isis, whose powers of healing were born from her wings, be forever depicted without them? It is from this question that the hypothesis arises: the winged Isis, specifically, is the healer. 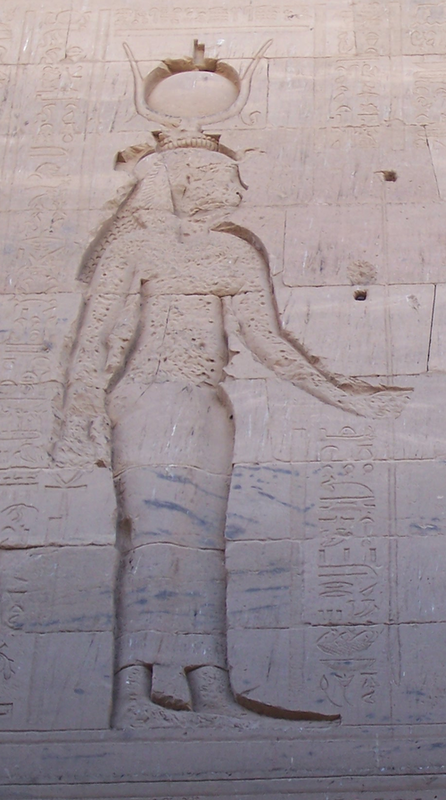 So imagine our surprise when we follow those birds, as if fluttering in on the life-giving breeze their wings provide, into the cool, dark, inner sanctuary at the Temple of Isis at Philae. And in the very heart of the inner sanctuary of this temple we find a rare example of the winged Isis in ancient Egypt. On Isis' head are the Horns of Hathor, and protruding from her forehead is the typical snake. 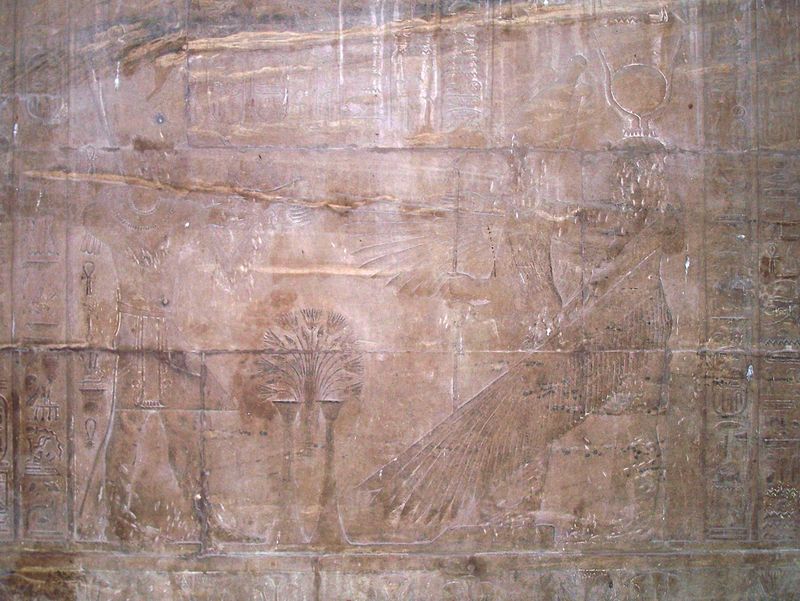 The wingspan of Isis is embracing her son Horus, who holds a vertical staff. Across from Isis stands another figure, also adorned with snakes. And between them stands a bouquet of the lotus and papyrus, symbols of Upper and Lower Egypt. Is it any wonder that our modern medical symbol would come to be a winged staff with snakes? And, which goddess is the most likely representative of this symbol: the ancient Egyptian Goddess Isis, or the Greek Iris, the Angel of Death? The caduceus may not have appeared on that Swiss printer's vignette until the 1500s, but Isis was referred to as a "woman doctor"—more than once—in the Ebers papyrus (~1500 B.C.E.) Yes, the very same ancient medical document that gave us the Rod of Ascelpius. Oh Isis, thou great enchantress, heal me, deliver me from all evil, bad, typhonic things, from demoniacal and deadly diseases and pollutions of all sorts that rush upon me, as thou didst deliver and release thy son Horus!